Before this season started, there appeared to be some assumptions regarding the Red Sox. The pitching staff would be excellent, both the starting rotation and the bullpen, with the offense (sans Mark Teixeira) lagging behind. That pitching was what would vault the team to the top of the American League East, on its way to a World Series berth. That hasn't been the case. The Sox' offense, led by the dynamic duo of Kevin Youkilis and Jason Bay, has been outstanding. It has been able to generate runs, comebacks, wins. Although the bullpen has been as good as advertised, the starting staff has lagged. With a dismal 5.85 ERA after the latest debacle - yesterday's 14-5 loss at the hands of the Tampa Bay Rays - the Sox are last in the league in that category. 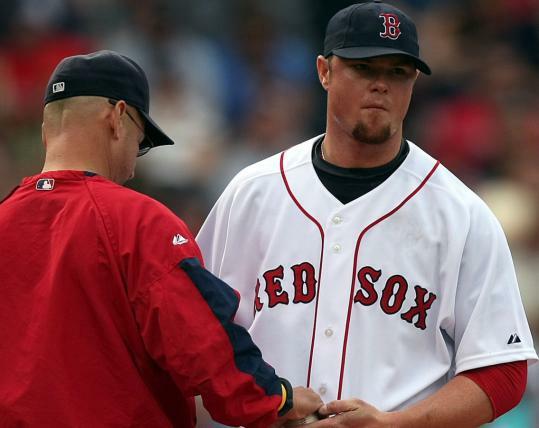 Blame Jon Lester, who has been a shell of his 2008 self, and a defense that didn't live up to its preseason hype, for this one. With the Rays' lead nine runs, the last innings were a formality, as the teams began first-pitch swinging to complete an already-lengthy game in front of a restless 37,773 at Fenway Park. "You look at our starting rotation coming out of spring training, and we thought we'd be pretty good," Lester said. "Not to say we aren't, but right now we're struggling. For some reason, from top to bottom, with the exception of [Tim Wakefield], he seems to be throwing the ball really well every time. I don't know what to tell you. I don't know the answer to that question, why we're struggling, what we're doing wrong. "Early in the year, we were leaving some balls up out over the plate, getting beat with them. But now it seems like guys are throwing the ball better and just aren't getting the results. With that being said, it's a long year. Hopefully, it will turn around. With this staff, it should turn around." It should. But will it? The Sox have played 31 games, and the only starter with an ERA lower than 5 is Wakefield (2.93). When their top three starters pitch - and that includes Justin Masterson in Daisuke Matsuzaka's spot - the Sox are 10-9. With Wakefield and Brad Penny starting, the team is 9-3. "I think we believe in them, and we think that it will get back to where it's supposed to be," manager Terry Francona said of his starting rotation. But yesterday, Lester wasn't where he was supposed to be, at least in terms of pitching. And Julio Lugo wasn't where he was supposed to be on the diamond. By the time Lugo ran into short left-center to collect a pop fly from Dioner Navarro for the third out of the fifth, the crowd let out a mock cheer. Not only had Lugo failed to get to a couple of ground balls in the inning, but 11 Rays had come to the plate, ballooning Lester's ERA and knocking him out of the game. It was an odd six-run inning, in which there were no home runs, just station-to-station baseball, including five singles to left field. The fans blamed Lugo, as they love to do, and they may have had a case. He should have had a ball hit by Navarro, which was called a hit, of which Francona said, "The last thing I want to do - and I would never do this - is throw a game on [Lugo]." But had he made the play, "potentially it's nobody on, two outs," Francona said. Lugo probably also could have gotten a potential double-play ball hit by Akinori Iwamura, and a ball that went by the glove of third baseman Mike Lowell, who was playing close to the grass on Pat Burrell. "If you get to it, you've got to catch it," Lugo said of Navarro's ball. "He hit that ball very good. I'm sure I could have come up with it." But the big culprit was Lester, who has been miserable against the Rays this season. The lefthander has a 12.54 ERA against Tampa Bay in two starts, and a 6.31 ERA overall. Although it was easy to credit Evan Longoria for a two-run homer in the first, on which he took a ball down in the zone and launched it onto the black tarp in center, the fifth inning was difficult to understand. "We don't get paid to go out there and go, 'I felt good, but we lost,' " Lester said. "That doesn't do anything. We get paid to go win ballgames and to pitch deep into the game and right now it just seems like it's few and far between. It seems like I have some good innings strung together and then some bad ones. I guess back to the drawing board tomorrow." The Sox have come back from big deficits, but this one was huge, even as they got back two runs in the bottom of the fifth. Lester had allowed eight runs, six coming on eight hits in the fifth, including a bunt single by B.J. Upton and a two-run Wall-scraping double by Longoria. Burrell also got two RBIs on that single to left past Lowell. It was single after single after single in that inning, with just the Longoria double going for extra bases. Starting with Iwamura, the Rays had four consecutive singles, followed by Longoria's two-bagger. After Carlos Peña struck out, there were three more singles, before Iwamura hit a fielder's choice and Navarro ended the inning with a pop. The Rays added five runs in the sixth, highlighted by a two-run double by Peña, as Hunter Jones and Takashi Saito got the same treatment as Lester. The Sox could muster only four runs after the one they got in the second on Rocco Baldelli's first homer with the Sox. Boston was 2 for 12 with runners in scoring position (finishing with 10 hits), compared with 7 for 15 for the Rays. With Lugo again under fire, and most of the starting rotation pitching poorly, there are things the Sox need to figure out. "Tip your hat, I guess," Lester said. "It's getting old to say that, as well. It's one of those deals, hopefully it will turn around. Hopefully, ground balls will start going at people. If not, it's going to be a really long year."